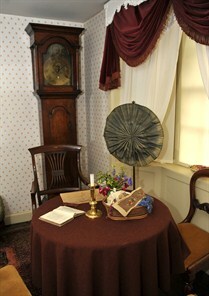 The Dickens House museum is housed in the cottage that was Charles Dickens’ inspiration for the home of Betsey Trotwood in David Copperfield. David’s description of Betsey’s cottage with its square gravelled garden full of flowers, and a parlour of old fashioned furniture still fits today. The character Betsey Trotwood is based on Miss Mary Pearson Strong who lived in the cottage that is now the museum. According to the reminiscences of Charles Dickens’ son Charley, he and his father regularly had tea and cakes in the parlour with the kindly and charming Miss Mary Pearson Strong. He also remembers that Miss Pearson Strong was completely convinced of her right to stop the passage of donkeys along the cliff top in front of her cottage. This belief became the donkey incident for the character of Betsey Trotwood, with the famous quote: “Janet! Donkeys! 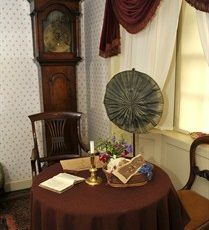 The museum is housed in the cottage that was Charles Dickens’ inspiration for the home of Betsey Trotwood in David Copperfield. David’s description of Betsey’s cottage with its square gravelled garden full of flowers, and a parlour of old fashioned furniture still fits today. The character Betsy Trotwood is based on Miss Mary Pearson Strong who lived in the cottage that is now the museum. According to the reminiscences of Charles Dickens’ son Charley, he and his father regularly had tea and cakes in the parlour with the kindly and charming Miss Mary Pearson Strong. He also remembers that Miss Pearson Strong was completely convinced of her right to stop the passage of donkeys along the cliff top in front of her cottage. This belief became the donkey incident for the character of Betsy Trotwood, with the famous quote: “Janet! Donkeys! 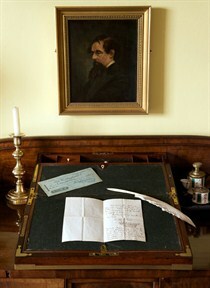 On entering the museum, visitors can experience the character of the house Charles Dickens visited. 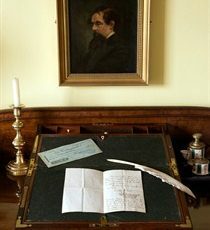 In the room that Charles knew as a dining room, you will find his writing box and mahogany sideboard, along with a fine collection of prints by H K Browne (Phiz), one of Dickens’ principal illustrators. There is also a selection of letters written by Charles Dickens about Broadstairs, and examples of early editions of Charles Dickens novels and serial publications. The parlour, described by Dickens and illustrated by Phiz, will be known to readers of David Copperfield. The cupboard in the corner may be recognised as the ‘press’ from which Miss Betsey produced the concoctions she poured down the throat of young David Copperfield, when he arrived at her home after running away from London. The archway, that was the door to the earlier Tudor cottage, leads into two further rooms, that contain a wide collection of Dickens commemorative items including Royal Doulton figurines, ceramics, and a display of Old Broadstairs. The stairs to the first floor are lined with pictures of the characters from Dickens novels and lead into two display rooms that contain Victorian costumes and Victoriana. These objects would have been everyday items to Charles and his family. 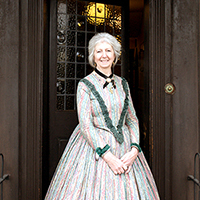 The museum is staffed by volunteer guides who are passionate about Charles Dickens. We look forward to showing you around this unique house and museum. 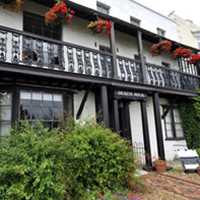 Dickens House Museum, Broadstairs is situated on the main seafront parade that over looks Viking Bay beach. Both buses and trains will bring you within easy walking distance of the house. Entry to the gift shop is free. Group visits are welcome all year round. For pre-booked visits, we arrange for a number of guides to be available, so that small groups can move round the museum and have plenty of opportunity to ask questions. The house will open specially to accommodate a group visit. Please contact us to discuss your needs so we can arrange every detail of your visit. Let us know the focus of your visit and any special requirements, so we can make your visit as enjoyable and worthwhile as possible. We are able to be flexible so that the visit is of maximum interest to your group. We are usually able to arrange visits at a time convenient for you. We are happy to tailor visits to your requirements. The museum is in a heritage and listed building and as such is not fully DDA compliant. The ground floor is accessible once the door step at the entrance is negotiated. Upstairs is accessible to those who are able to climb a flight of stairs.